Amazing Sports is a sports-oriented program in Cebu that aims to showcase the different sports and leisure activities that are played and enjoyed by Cebuanos in the Sunny Islands of Cebu. 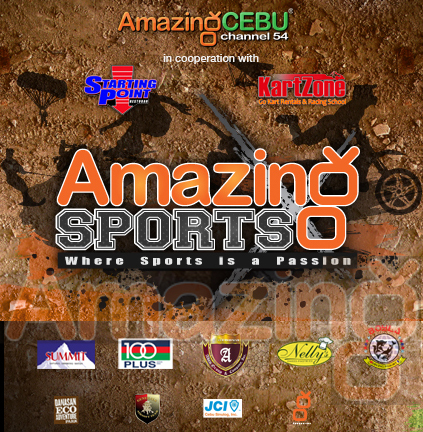 Amazing Sports airs at Amazing Cebu Channel 54 on Saturdays. Hosted by dance-sport enthusiast Anne Montecillo and footballer Gino Galicia, Amazing Sports will promote the local sporting scene of Cebu, hidden from mountain ranges of the island like Arnis and Eskrima, to the cityscape down to the sandy beaches of the island. Amazing Sports in its pilot episode which will air on Nov 18 will feature Cebuanos that purposely choose the steeps in the mountains of Minglanilla Cebu to play Longboarding, yes long boarding, not skateboarding. Plus! My favorite water-sports also be in the pilot episode this Saturday - Skimboarding. The skimboarding sessions takes place at the seashores of Liloan Cebu. I know its a preferred venue for skimboarders in Cebu aside from Argao for constant waves that fits wave-riding or no waves at all for sand-skimming. Mactan Island has few skim-boarding spots also where I usually played and my summer destination - Sta. Fe, Bantayan Island. Amazing Cebu Channel 54's commitment in offering quality shows to Cebuanos in the island and abroad making Cebu's first local Sports TV show -The Amazing Sports! Catch the mall launching of Amazing Sports at Ayala Activezone until friday this week and drop by to suggest your favourite sports for future episodes. 0 comments: on "Watch Amazing Sports only at The Amazing Cebu Channel 54"